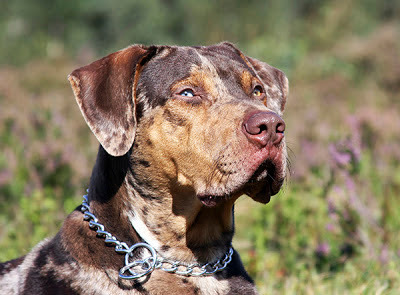 The Catahoula is believed to be the first dog breed developed in North America. They have been bred more for abilities than appearance, and can range greatly in size and color. The Catahoula is a highly intelligent and energetic dog, and if it has a job to do, the job is taken seriously. They often herd or hunt, but are also excellent family dogs, as long as they're allowed to be with the family. They don't like to be alone. They are protective and a natural alarm dog who will alert to anything out of the ordinary. This breed in on my "want someday" list! They're cool. My current foster dog is a Catahoula mix. She's really smart, and super-athletic! They're beautiful dogs! I've only met one that I could recognize. I know a few from twitter, but that is it. When I was in college, one of my classmates had two of these. I had never heard of them before but now I've met so many of them. Years ago met one at an animal shelter where I volunteered but was not in a position to adopt her. Heard that she went to a rescue, and years later, in a nearby city, I happened to meet her adopter. The dog had long since passed on, but she was lovingly remembered as a wonderful companion.